Israel and Hamas are close to a deal to swap 1,000 Palestinian prisoners for an Israeli soldier held for more than three years by the Islamic militant group, a Palestinian familiar with the talks said Monday. Israeli President Shimon Peres, who met with Egypt's president in Cairo Sunday, confirmed progress in the negotiations to free captured soldier Sgt. Gilad Schalit, but Israeli officials refused to comment further. Hamas' deputy political leader, Moussa Abu Marzouk, also said "there is progress" in the talks. Neither Peres nor Abu Marzouk gave details on the timing of a possible deal. 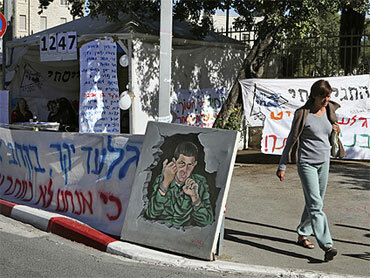 The Palestinian close to the talks said Palestinian prisoners would be released in two stages. The initial batch is expected to include many serving lengthy sentences for deadly attacks on Israelis. Among them would be Marwan Barghouti, a popular leader of Hamas rival Fatah, who is serving multiple life sentences for involvement in deadly attacks. Barghouti is seen as a top contender for the next Palestinian president. While negotiations have been dragging on for years, conditions appear to be ripening for a deal. Though no official statements have been made, it appears that Israeli Prime Minister Benjamin Netanyahu is prepared to release more hard-core Palestinian militants than his predecessor, Ehud Olmert, fulfilling a key Hamas demand. Hamas also has shown flexibility on some important issues, particularly Israel's insistence that some prisoners be deported after their release. Such a deal would give Netanyahu an important diplomatic victory at a time when he is under heavy international pressure to make progress with the Palestinians. Hamas also appears eager to reach a deal. The group, which rules the Gaza Strip, faces deep international isolation and a painful Israeli economic blockade and the swap is expected to pave the way for lifting the embargo. But the deal could weaken Western-backed Palestinian President Mahmoud Abbas if Barghouti, his main challenger, is indeed released. A senior Hamas delegation led by strongman Mahmoud Zahar and two top members of the group's armed wing crossed into Egypt from Gaza Monday as Israeli military helicopters hovered overhead. Despite witness accounts on the helicopters, the Israeli military said it had no aircraft in the area at the time. The Palestinian close to the talks says Egyptian and German mediators hope to complete the deal by the Muslim holiday of Eid al-Adha, which begins this weekend. While the key details of the names and number of Palestinian prisoners to be freed are set, smaller details on timing and logistics must still be worked out, he said, speaking on condition of anonymity because the talks were ongoing. He said the deal is expected to see Israel release some 450 prisoners in the first stage as Schalit is handed over to the Egyptians. They include top Hamas militants and leaders of other Palestinian factions. The remainder would be released weeks, or even months later. At Israel's insistence, some 150 prisoners are expected to be deported to countries elsewhere in the Middle East or Europe. Hamas-allied militants captured Schalit during a cross-border raid in June 2006 and took him to Gaza. Last month, Hamas released a short video of Schalit, the first concrete sign that he is alive and healthy. Egyptian mediators have been trying to broker a deal since the capture. But talks have repeatedly broken down. More recently, German mediators joined the efforts. Netanyahu appears to have agreed to free some militants that his predecessor, Ehud Olmert, refused to consider. The Palestinian said Netanyahu also has agreed to include some Arab citizens of Israel in the deal. The addition of the German mediators also appears to have improved the negotiating climate. Toward that end, Hamas announced over the weekend that it had secured agreement from all militant factions in Gaza to halt rocket attacks on Israel. An agreement would also give Hamas a lift in its bitter rivalry with Abbas. Hamas seized control of Gaza from Abbas' forces in 2007. Abbas, meanwhile, has been weakened by a deadlock in peace efforts with Israel. An emboldened Hamas, along with the return of Barghouti to the political scene, could likely spell further trouble for the embattled Palestinian leader.